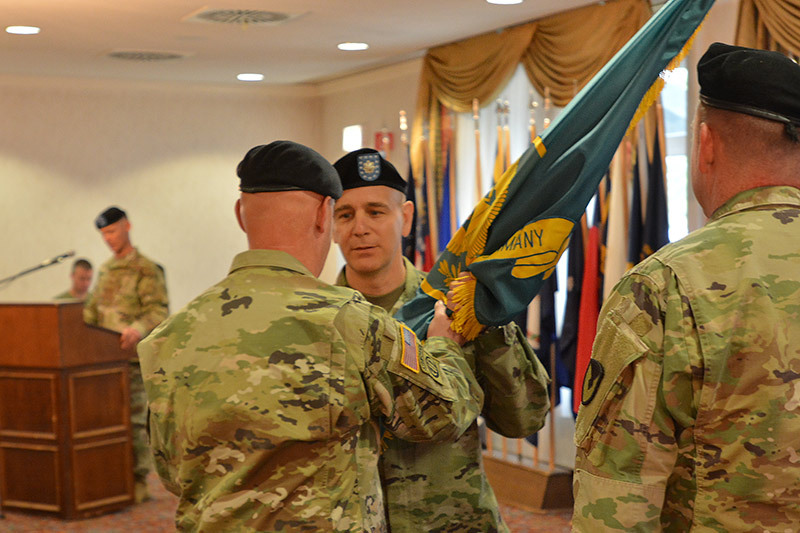 GRAFENWOEHR, Germany — The 405th Army Field Support Battalion-Germany welcomed Lt. Col. Matthew A. Price at a change of command ceremony, here, June 14. Lt. Col. Matthew A. Price assumed command from Lt. Col. Charles W. McPhail, who served as commander of the 405th AFSB since June 2016. McPhail spearheaded several missions to provide expert logistics support to various operational platforms. He also established the first ever Logistic Support Element in Poland to support NATO exercises. McPhail brought a wealth of European experience to this assignment. The 405th AFSBn-Germany proved to be an invaluable forum allowing the logistics professionals to cross-talk, learn, grow and further enhance their readiness capabilities. The AFSBn-Germany ensures that Soldier are well-read in current tactics, techniques and procedures. The battalion provided hands-on enterprise logistics support to over 30 major exercises in 12 European countries. The battalion also supported six regionally-aligned force rotational brigade deployments and Combined Resolve rotations at the Joint Multinational Readiness Center in Hohenfels, Germany. Price is coming from Hohenfels JMRC and is ready for his new challenge.